The album “Geogaddi“ by Boards of Canada lasts one hour and contains 22 tracks, whereas “Young Team“ by Mogwai also lasts one hour but only has 10 tracks. This means I can listen to Mogwai twice as much, and Boards of Canada would still beat them in my rankings. “Lift your skinny fists..“ by Godspeed You! Black Emperor only has four tracks but goes on for more than an hour. Those guys aren’t going to trouble the scorers at all, even though I listen to them a lot. I suppose a more representative ranking of my musical tastes would be based on the actual time spent listening to an artist, rather than by number of tracks, but I can see that collecting this data would be a much more bandwidth-heavy exercise. It is clearly the easiest data to collect but to measure my attention in discrete tracks isn’t giving a true representation of things. Matt is using MusicBrainz web services to determine an average song length for your top artists, which means his reweighting approach is not necessarily representative for the songs you actually listened to, but it’s a cool demonstration of his idea nevertheless. Update — From the comments: it turns out back in January 2006 Andrew Conkling founded a group to lobby that idea, called Users for Last.fm song length tracking. Check it out, it has some interesting discussions! I had been thinking about the same thing myself. I listen to a lot of bands that have songs ranging from 10 to 30 minutes. It would be a nice addition at least to see how much time you’ve spent listening to bands instead of just how many times. Yay! Great thing! Maybe last.fm team should consider implementing such thing? It would certainly be a great optional extra for Last.fm to impliment. That’s neat. Good work lad. Yes, this is something that’s always bothered me. Good to see someone take it into consideration and create something with more accurate rankings. Any plans to add improvements of this sort to last.fm? a similar issue that has made me wonder is the group charts. i think a better basis for the charts would actually be the number of tracks played by an artist throughout the group. for instance, i’m in a group w/ 16 members. let’s say i and one other person in my group listen to an album that no one else in that group listens to that week, and we both listen to it all the way through a total of 20 times. it only gets a chart value of “2” in the group charts. but if the other 14 members all listen to just one track by a certain other artist during that same week, it shoots to the top of the charts with a chart value of “14”. that just doesn’t make sense to me. Too bad it only does artists, I’d much rather see this for tracks (and hopefully this will finally banish Boten Anna from my top tracks ;). Also, a lot of my Tiesto music isn’t counted for him because he does a lot of stuff together with other artists. Many thanks to you all for your kind words and encouragement. I’ll be working to incorporate some suggestions over the weekend, and hope to have something live in the next few days. Watch this space. Now this was completely awesome. I hope that the last.fm team takes the time and effort necessary to implement a system like this officially into last.fm , cause my charts were completely turned upside down! And to me last.fm is all about measuring your own listening habits, all the other stuff is just added extras. So having the charts as accurate as possible should be a top priority, no matter how complicated it might be to implement. I created a group about this a while ago, and it’s gotten pretty good feedback. I’m happy to see this being noted by the developers and site admins as well. I foresee a great future! And let users have choise of which type of sorting they want. Very cool.. he even provides an .xml feed of the results. The problem I have with this is DJ Olive is at the top of my list. I have one album by DJ Olive that is about 18 short tracks, and then I have two that are 60 minute tracks. So my DJ Olive averages 9 minutes per track. Then there are groups that have short intro tracks that would be scoring much lower than deserved. You could probably clean up a lot of this by taking the average of the middle 80% (eliminating the bottom and top 10% of the range). i don’t think it would be too hard for a scrobbler program to upload the track length when it is scrobbled to allow the last.fm databases to know how long you have been listening to a particular artist. could this be implemented? I’d love to see something like this implemented so I could use it for albums/weekly charts/etc instead of just top artists. I get the same effect as Televiper with Fantômas on my list. Fantômas “Delirìum Còrdia” is one track, 68 minutes long. But “Suspended Animation” is 30 tracks with 1 minute 30 seconds songs on average. But I still think it’s a great idea to weigh in when calculating top artists. 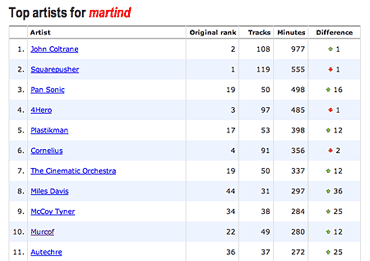 But it has to be done with submitting the time listened when scrobbling, not on artist averages. I have just updated the application to include album charts and different charts for different time periods. I agree that the best way to generate these charts is to include track time in the scrobbles and calculate the time-based rankings automatically, but that’s one for last.fm to ponder on. I’m sure there are good reasons why they’ve not done it up until now. Having said that, all this is only possible due to them offering a wealth of information via XML and using MusicBrainz IDs where possible. Anyway, hope you guys like the new version. The iScrobbler software for the Mac includes total elapsed times in its local data, i don’t see why the last.fm database can’t do similarly. While we’re on the topic of important shortcomings of the databases: when are you going to fix the problem with multiple artists and groups who go by the same name? This causes some really laughable errors in the ‘similarity’ rankings, etc, because there are a number of artists with identical monikers who are utterly different stylistically. Plus it doesn’t seem fair to give “aggregate” rankings to artists because of a discrepancy in their nomenclature. If you look at a database such as Discogs.com, they solve the problem by using an additional identifier such as “(1)” or “(2)” or “(3)” after the names of the artists to distinguish their different identities. You can look at an example such as all of the groups called “OM” to see what i mean: there are a half-dozen entirely different performers who all use that name, and all their stats are being lumped together erroneously. Of course, it may be too late now to retroactively fix these kinds of gigantic errors in the fundamental structure of your data aggregation. But i suspect those are not your biggest problems; being owned by a charter member of the RIAA seems like a far bigger issue now than any of these little technical quibbles. This is excellent, it’s replaced my last.fm page as my 1st choice to see my personal listening stats. Much, much more relevant to see the time you listen to an artist rather than the number of tracks. but now we have a new problem! if a song is 40 minutes long and you will start to scrobble by time then if it is scrobbled and you lose interest about 5 minutes into the song that song will boost the band’s listening time by an extra 35minutes…this is huge, could be an album , it’s the inversion of the situation. Another example is listening to an BBC essential mix which is 2 hours long, if it’s scrobbled and you decide to change the song after 15 minutes the band doing the mix will have an extra 1h45!! the solution that makes more sense to prevent this would be do more than one scrobble per song – maybe each X minutes? This of course could bring huge bandwidth problems so i’d think about a “if condition” for songs with more than regular size (5m). just a few thoughts written on a rush,cheers! This applies most I think to listeners of classical. For example, Allan Pettersson’s 6th lasts 1hr 04 mins and is one single track. Some one listening to random pop would have 15 + tracks by the same measure.